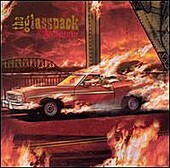 The fuzzed-out garage rock of Louisville, KY's The Glasspack does not come with pretense. Instead, it is fueled by the same intoxicants and spirits that have kept the rock 'n' roll flag flying free for generations. On the 11-track sojourn into the nasty world of thick guitars and pumping rhythms, the distorted vocals speak to the listener like the devil on their shoulder, while the menacing grooves of tunes like "Oil Pan" and "Hydroplane" provide the soundtrack to swilling whiskey and raising as much hell as necessary. Backed with a shot of adrenaline found on such triumphs as the blazing "Peepshow", the domineering aura of three guys getting high, drunk, and stoned while blasting out balls-out, blues-infested rawk is reason enough to get lost with The Glasspack, even if a temporary lapse of decency is all you can muster.